Not to be confused with Mike Tomlin. Michael August Timlin (/ˈtɪmlɪn/; born March 10, 1966) is an American former relief pitcher in Major League Baseball (MLB). 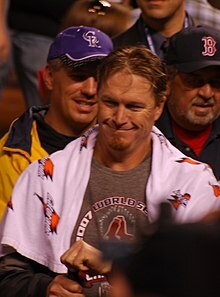 Timlin played on four World Series championship teams in an 18-year career; the 1992 Toronto Blue Jays, 1993 Toronto Blue Jays, 2004 Boston Red Sox, and 2007 Boston Red Sox. Timlin was born in Midland, Texas, to Jerome Francis Timlin Sr. and Nancy Sharon Beyer. Timlin graduated from Midland High School; he then attended and pitched at Southwestern University in Georgetown, Texas, where he was a member of Phi Delta Theta. Listed at 6 feet 4 inches (1.93 m) and 205 pounds (93 kg), Timlin threw and batted right-handed. Timlin was known for his 93 mph (150 km/h) fastball. His sliders and sinkers had a downward break, inducing a significant number of ground balls. Timlin was drafted in the 5th round of the 1987 amateur draft by the Toronto Blue Jays, and signed with the team on June 6, 1987. From 1987 through 1990, Timlin played for several of Toronto's minor league teams; the rookie league Medicine Hat Blue Jays (1987), the Class A Myrtle Beach Blue Jays (1988), the High A Dunedin Blue Jays (1989–90), and the Double-A Knoxville Blue Jays (1990). Timlin spent the 1991 season with Toronto. He made his first major league appearance on opening day, April 8, pitching ​1 1⁄3 innings in relief against the Boston Red Sox. Two days later, he recorded his first strikeout (Tom Brunansky) and had his first win, after pitching an inning in relief against the Red Sox. For the regular season, Timlin appeared in 63 games, all but 3 in relief, compiling a record of 11–6 with 3 saves and a 3.16 earned run average (ERA). In the postseason, he made four relief appearances in the American League Championship Series (ALCS) against the Minnesota Twins, including taking the loss in Game 3 after giving up a home run to Mike Pagliarulo in the 10th inning. Timlin was sixth in Rookie of the Year voting. During the 1992 season, Timlin spent time with the High A Dunedin Blue Jays (6 games), the Triple-A Syracuse Chiefs (7 games), and the major league Blue Jays (26 games). With Toronto he compiled a record of 0–2 with 1 save and a 4.12 ERA. In the postseason, he made two relief appearances in the ALCS against the Oakland Athletics, and two relief appearances in the World Series against the Atlanta Braves. He recorded his first postseason save in the deciding Game 6, facing a single batter, Otis Nixon, who Timlin threw out at first base on a bunt attempt in the 11th inning, for the final out of the series. For the 1993 season, Timlin played 4 games with the High A Dunedin Blue Jays, and 54 games with Toronto, all in relief. His record with Toronto was 4–2, with 1 save and a 4.69 ERA. In the postseason he made one appearance in the ALCS against the Chicago White Sox, and two appearances in the World Series against the Philadelphia Phillies. The Blue Jays won the World Series for the second consecutive year, giving Timlin two World Series rings in his first three MLB seasons. Timlin made 34 appearances with Toronto in the 1994 season (0–1, with 2 saves and a 5.18 ERA), and 31 appearances in the 1995 season (4–3, with 5 saves and a 2.14 ERA). In 1995 he also appeared in 8 games with Triple-A Syracuse. For the 1996 season he appeared in 59 games with Toronto (1–6, with 31 saves and a 3.65 ERA). During the 1997 season, Timlin made 38 appearances with Toronto through July 29; he had a 3–2 record, with 9 saves and a 2.87 ERA. Timlin and Paul Spoljaric were traded to the Seattle Mariners in exchange for José Cruz Jr. on July 31, 1997. In his seven seasons with the Blue Jays, Timlin appeared in 305 MLB games, compiling a record of 23–22, with 52 saves and a 3.62 ERA. In ​393 1⁄3 innings pitched, he struck out 331 batters while walking 167. Timlin made his first appearance with the Mariners on August 1, 1997, pitching one inning in relief against the Milwaukee Brewers. He made 26 total appearances with Seattle during the regular season; he had a 3–2 record, with 1 save and a 3.86 ERA. He appeared in one game in the American League Division Series (ALDS), giving up 4 runs to the Baltimore Orioles in ​ 2⁄3 of an inning during Game 1. For the 1998 season, Timlin appeared in 70 games with Seattle; he had a 3–3 record, 19 saves, and a 2.95 ERA. After the season, Timlin became a free agent. In his two seasons with Seattle, he appeared in a total of 96 games with 20 saves, while striking out 69 and walking 21 in 105 innings pitched, with a 3.17 ERA. On November 16, 1998, Timlin signed with the Orioles. During the 1999 season, he appeared in 62 games for the Orioles, with a record of 3–9, 27 saves and a 3.57 ERA. For the 2000 season, he was with the Orioles through late July, appearing in 37 games, with a record of 2–3, 11 saves and a 4.89 ERA. On July 29, 2000, Timlin was traded (along with cash) to the St. Louis Cardinals in exchange for Chris Richard and minor league player Mark Nussbeck. In two seasons with Baltimore, Timlin appeared in a total of 99 games, compiling a record of 5–12, with 38 saves and a 4.04 ERA, while striking out 76 and walking 38 in 98 innings pitched. Timlin made his first appearance with the Cardinals (and in the National League) on July 30, 2000, pitching one inning in relief against the New York Mets. He made 25 total appearances with the Cardinals during the regular season; he had a 3–1 record, with 1 save and a 3.34 ERA. He appeared in two games of the National League Division Series (NLDS) against the Atlanta Braves, and in three games of the National League Championship Series (NLCS) against the Mets. He took the loss in Game 2 of the NLCS, giving up an unearned run while pitching the 9th inning. For the 2001 season, Timlin appeared in 67 games with St. Louis; he had a 4–5 record, 3 saves, and a 4.09 ERA. He had his first major league at bat on October 6 against the Houston Astros, grounding out in the 5th inning. He made one appearance in the postseason, pitching ​1 1⁄3 scoreless innings against the Arizona Diamondbacks in the NLDS. During the 2002 season, he was with the Cardinals through late July, appearing in 42 games, with a record of 1–3, no saves and a 2.51 ERA. On April 19, he made his first start since his rookie season, taking the loss against the Milwaukee Brewers; he pitched ​4 1⁄3 innings, giving up 4 runs (all earned) while striking out 3 batters and issuing 1 walk. On July 29, 2002, Timlin, Plácido Polanco, and Bud Smith were traded to the Philadelphia Phillies in exchange for Doug Nickle, Scott Rolen, and cash. In his three seasons with St. Louis, Timlin appeared in 134 games, compiling a record of 8–9, with 4 saves and a 3.36 ERA. In ​163 1⁄3 innings pitched, he struck out 108 batters while walking 46. Timlin made his first appearance with the Phillies on July 31, 2002, pitching two innings in relief (and getting the win) against the San Francisco Giants. Through the end of the regular season, he appeared in 30 games with Philadelphia, compiling a 3–3 record, with no saves and a 3.79 ERA. In ​35 2⁄3 innings pitched, he struck out 15 batters while walking 7. After the season, Timlin again became a free agent. On January 6, 2003, Timlin signed with the Red Sox. During the 2003 season, he appeared in 72 games for Boston, compiling a 6–4 record, with 2 saves and a 3.55 ERA. In the postseason, he appeared in three games of the ALDS against the Oakland Athletics, and five games of the ALCS against the New York Yankees. In those eight games, he pitched ​9 1⁄3 innings, facing 32 batters while striking out 11 and only giving up two walks, one hit, and no runs. Timlin made 76 appearances during the 2004 season; he had a 5–4 record, with 1 save and a 4.13 ERA. On September 3, he made his 800th major league appearance, becoming only the 29th pitcher in major league history to reach that mark. In the postseason he appeared in three games of the ALDS against the Anaheim Angels, five games of the ALCS against the Yankees, and three games of the World Series against the St. Louis Cardinals. In those 11 games, he pitched ​11 2⁄3 innings, facing 56 batters while striking out 7 and giving up 7 walks, 15 hits, and 8 runs. With Boston's sweep of St. Louis in the World Series, Timlin earned the third championship of his career. Timlin's 2005 season yielded the best numbers of his career. He made 81 appearances (a career high) with a record of 7–3, 13 saves, and a 2.24 ERA. In ​80 1⁄3 innings pitched he struck out 59 while walking 20 and only allowing two home runs. He pitched an inning in the ALDS, giving up one run as the Red Sox were swept by the White Sox. After his first three seasons with the Red Sox, Timlin struggled with injuries to his right shoulder and left oblique in 2006 and the beginning of 2007, making multiple visits to the disabled list. For the 2006 season, he made 68 appearances with a record of 6–6, 9 saves, and a 4.36 ERA. During the 2007 season, Timlin appeared in 50 games with a record of 2–1, 1 save, and a 3.42 ERA. He also made eight appearances with the Triple-A Pawtucket Red Sox while rehabilitating. He made his 1,000th career appearance on August 31, against the Baltimore Orioles. In the postseason, he made three appearances in the ALCS against the Cleveland Indians, and three appearances in the World Series against the Colorado Rockies. In those six games, he pitched ​5 2⁄3 innings, facing 30 batters while striking out 7, issuing no walks, and giving up 2 runs. With Boston's sweep of Colorado in the World Series, Timlin earned the fourth championship of his career. Timlin made 47 appearances during the 2008 season, with a record of 4–4, 1 save, and a 5.66 ERA (the highest of his career). He also made five rehabilitation appearances with Triple-A Pawtucket. In the postseason, he appeared in two games against the Tampa Bay Rays in the ALCS; he took the loss in Game 2 after giving up a run in the 11th inning, and his two innings in relief during Game 4, which Boston lost by 9 runs, would be the final MLB appearance of his career. After the season ended, Timlin again became a free agent. In his six seasons with Boston, Timlin appeared in 394 MLB games, compiling a record of 30–22, with 27 saves and a 3.76 ERA. In 409 innings pitched, he struck out 273 batters while walking 98. On July 29, 2009, Timlin signed a minor league contract with the Colorado Rockies. He made a total of six minor league appearances; two for the rookie league Casper Ghosts and then four for the Triple-A Colorado Springs Sky Sox. On August 13, 2009, Timlin was released by the Rockies, following which he retired from baseball. In 18 MLB seasons, Timlin compiled a record of 75–73, with 141 saves, and a 3.63 ERA. In ​1204 1⁄3 innings pitched, he struck out 872 batters while walking 377. As a hitter, he had 7 at-bats (all with St. Louis); he struck out 4 times and did not reach base. As of July 2017, Timlin ranks eighth all-time in appearances for MLB pitchers, having played in 1,058 games. Timlin wore uniform number 40 with Toronto, Seattle, and Baltimore. When he was traded to St. Louis in 2000, uniform number 40 was already in use by Andy Benes, so Timlin changed to uniform number 50. He later kept that number with Philadelphia and Boston. Timlin was ejected twice in his MLB career, both times during the 2002 season. Timlin was also a member of the United States national baseball team that competed in the 2006 World Baseball Classic. Timlin has three sisters; Jeri Lynn, Tracy, and Sherri. He and his wife, Dawn, have two children; a son born in 1996, and a daughter born in 2000. The Timlins are organizers of "The Sharon Timlin Memorial 5K Race to Cure ALS", held annually since 2004; Timlin's mother died of amyotrophic lateral sclerosis (ALS) in March 2002. In 2006, with former teammates Johnny Damon and Édgar Rentería, Timlin was featured on an episode of the animated television series Arthur, providing his voice for the Elwood City Grebes pitcher "Winlin." Timlin was the 2007 recipient of the Lou Gehrig Memorial Award, which is awarded annually to an MLB player who has made exemplary contributions to "both his community and philanthropy." On April 19, 2009, Timlin was honored by the Red Sox; he threw out the ceremonial first pitch on "Mike Timlin Day" at Fenway Park. In 2010, Timlin was inducted to Southwestern University's hall of fame. During the 2017 season, Timlin worked as color commentator with play-by-play announcer Dave O'Brien for several Red Sox games in July. Timlin was present at the concert where the Las Vegas shooting occurred on October 1, 2017, but escaped unharmed. ^ "Mike Timlin – Phi Delta Theta Fraternity". phideltatheta.org. Retrieved July 30, 2017. ^ "Boston Red Sox 6, Toronto Blue Jays 2". Retrosheet. April 8, 1991. ^ "Toronto Blue Jays 5, Boston Red Sox 3". Retrosheet. April 10, 1991. ^ "Minnesota Twins 3, Toronto Blue Jays 2". Retrosheet. October 11, 1991. ^ "1991 ALCS, Game 3: Twins @ Blue Jays". Classic Twins. Retrieved July 31, 2017 – via YouTube. ^ "1991 Awards Voting". Baseball-Reference.com. Retrieved July 30, 2017. ^ "Toronto Blue Jays 4, Atlanta Braves 3". Retrosheet. October 24, 1992. ^ "92 WS, GM 6, TOR@ATL: Blue Jays win the World Series". MLB.com. Retrieved July 30, 2017 – via YouTube. ^ "Milwaukee Brewers 8, Seattle Mariners 3". Retrosheet. August 1, 1997. ^ "Baltimore Orioles 9, Seattle Mariners 3". Retrosheet. October 1, 1997. ^ "New York Mets 4, St. Louis Cardinals 2". Retrosheet. July 30, 2000. ^ "New York Mets 6, St. Louis Cardinals 5". Retrosheet. October 12, 2000. ^ "St. Louis Cardinals 10, Houston Astros 6". Retrosheet. October 6, 2001. ^ "Arizona Diamondbacks 5, St. Louis Cardinals 3". Retrosheet. October 12, 2001. ^ "Milwaukee Brewers 6, St. Louis Cardinals 1". Retrosheet. April 19, 2002. ^ "Philadelphia Phillies 8, San Francisco Giants 6". Retrosheet. July 31, 2002. ^ "Chicago White Sox 5, Boston Red Sox 3". Retrosheet. October 7, 2005. ^ "Tampa Bay Rays 9, Boston Red Sox 8". Retrosheet. October 11, 2008. ^ "Tampa Bay Rays 13, Boston Red Sox 4". Retrosheet. October 14, 2008. ^ "Career Leaders & Records for Games Played". Baseball-Reference.com. Retrieved July 30, 2017. ^ "Mike Timlin". Retrosheet. Retrieved August 1, 2017. ^ a b "About - The Sharon Timlin Memorial 5k Race to Cure ALS". sharontimlinrace.org. Retrieved July 31, 2017. ^ "The Curse of the Grebes/Arthur Changes Gears". IMDb. 2017. Retrieved July 30, 2017. ^ "SU ALUMNUS AND CURRENT RED SOX TIMLIN WINS LOU GEHRIG AWARD". southwesternpirates.com. January 7, 2009. Retrieved July 30, 2017. ^ "Michael A. Timlin - Inducted - 2010". southwesternpirates.com. 2010. Retrieved July 30, 2017. ^ "Mike Timlin Induction into Southwestern University's Athletic Hall of Fame". southwesternpirates. Retrieved August 1, 2017 – via YouTube. ^ Burdge, Lucy (July 27, 2017). "Mike Timlin responds to critics of his broadcasting skills". WEEI.com. Retrieved July 30, 2017. ^ Buell, Spencer (October 2, 2017). "Boston Red Sox pitcher Mike Timlin is fine after the shooting in Las Vegas". bostonmagazine.com. Retrieved October 2, 2017. Hunter, Paul (October 16, 2015). "'Dude, watch the bunt' — Mike Timlin recalls final out of '92 World Series". Toronto Star. Retrieved August 1, 2017.